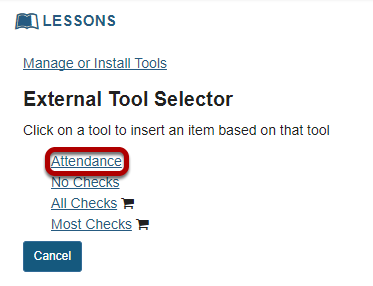 Sakai Community DocumentationSakai 19 User Guide (English) LessonsHow do I add an external tool on a Lessons page? Instructors can add links to external tools, or LTI items, on a Lessons page. This allows instructors to seamlessly incorporate content from third party applications within the site. Click Add Content, then Add External Tool. 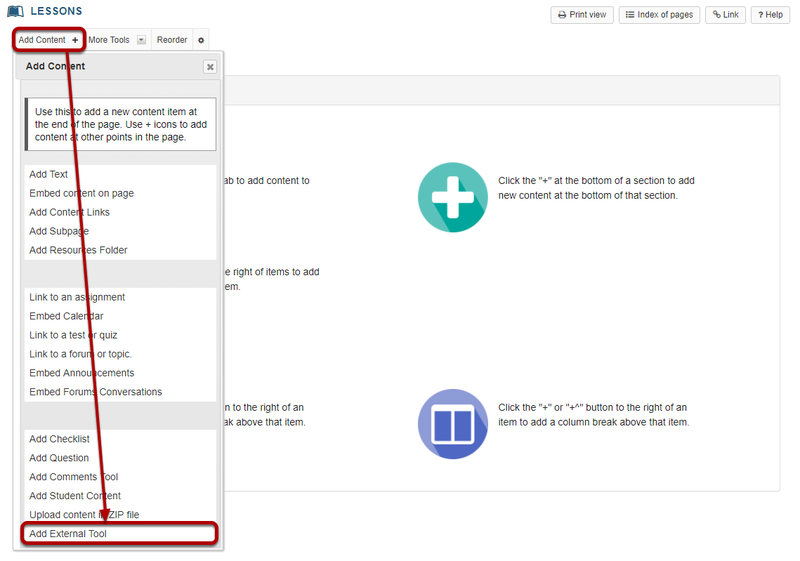 From the Add Content drop-down menu, select Add External Tool. Select a tool from items already configured for your institution. If your institution has already configured one or more external tools at the system level, you may choose from any of the tools listed here. To add it to the Lessons page, click on the tool title. The external tool will now appear on the Lessons page. Or, click Manage of Install Tools to add a new tool. If there are no system level tools, or the tool you would like to add does not appear in the list, click on the Manage or Install Tools link to configure a new tool for your site only. Click Install LTI 1.1 Tool. This is the title of the link as it will display on your Lessons page. Choose whether or not the title can be changed. 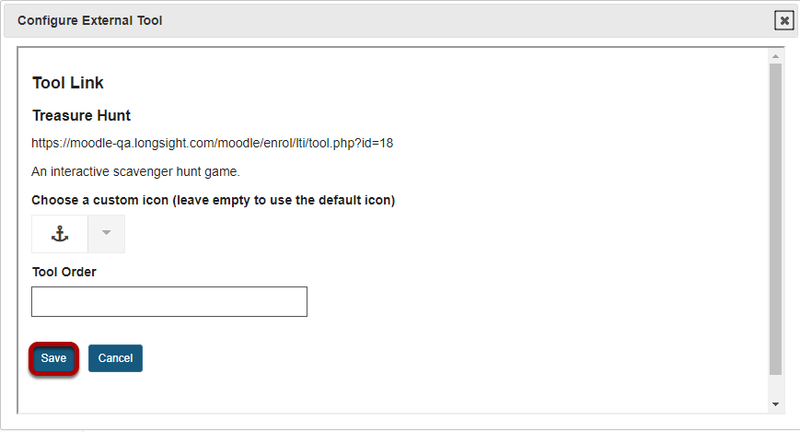 This is the title of the tool as it will display if added to the Tool Menu in the site. Choose whether or not the button text can be changed. Add a description of the external tool. Specify whether or not the tool is enabled. 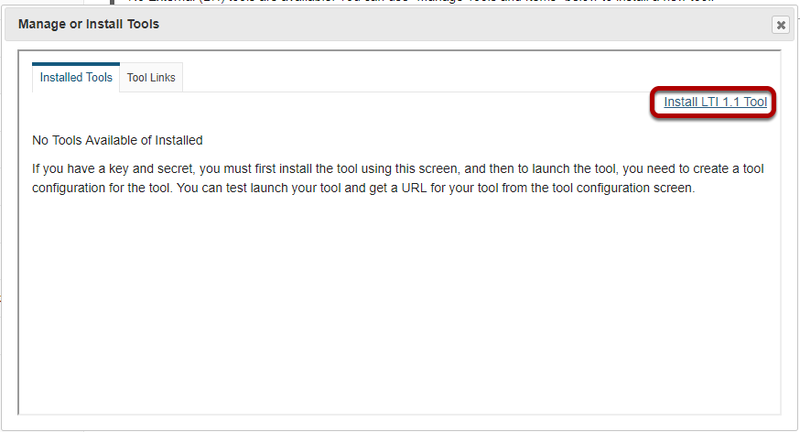 The Launch URL is provided by the external tool application provider. Specify whether or not the launch URL can be changed. The launch key is provided by the external tool application provider. It is unique to you. Specify whether or not the launch key can be changed. The launch secret is provided by the external tool application provider. The launch secret is a unique value. Specify whether or not the launch secret can be changed. Enter a specific frame height if desired. Otherwise, leave blank to use the default height. 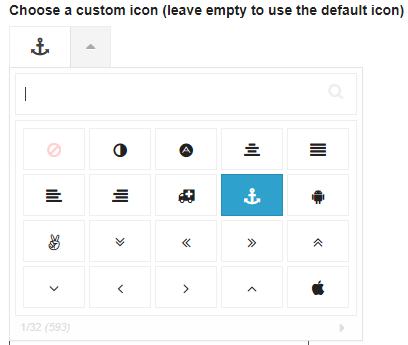 If you want the tool to appear in a specific order, use the up and down arrows to select the order. Otherwise, leave blank to use the default order. Specify whether or not the frame height can be changed. 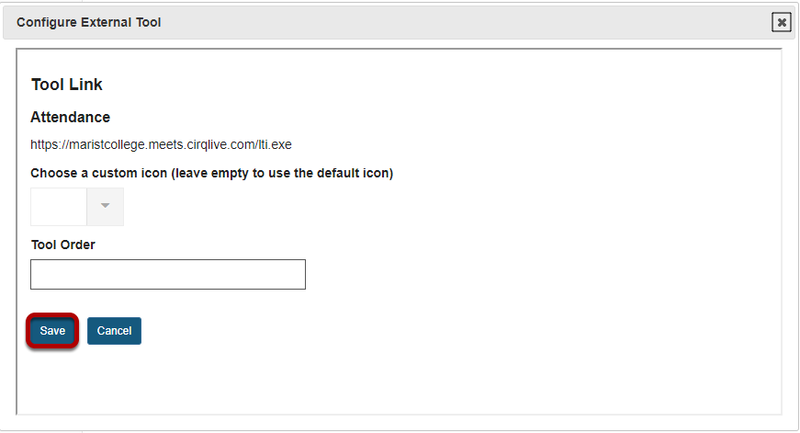 Choose whether or not you want the configuration dialog to display when the tool is selected. Check the boxes next to the settings you want to enable. Note: Most LTI tools require user names if there is a grade associated with the activity. Check the boxes next to the services you want to enable. Specify Content Item Selection launches. Note: Be sure to check to see if your external tool is capable of Content Item launches before selecting those options, as not all tools support this type of launch. Launching in debug mode is typically only used for advanced troubleshooting or application development purposes. 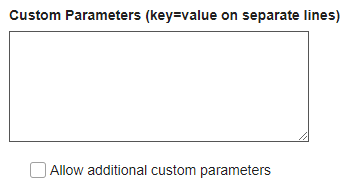 If you would like to add custom launch parameters, you may do so here. If you would like to display custom text to users before they are redirected to the external tool, you may enter it here. Note: This field is plain text only. HTML is not allowed. Click Save to save your tool configuration settings. The new tool will now appear in the list when you go to Lessons > Add External Tool. The external tool link will appear on the Lessons page. Prev: How do I upload content in a zip file on a Lessons page? Next: How do I enable Lessons subpage navigation in the Tool Menu?